Title A Simple Clock and Date display. Summary CClockST is a class derived from MFC CStatic class. CClockST just subclasses the supplied CStatic control in your dialog and implements a simple clock and date! 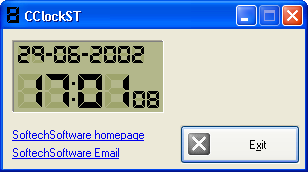 in your dialog and implements a simple clock and date! match the same size of the clock. There is no way to stop the clock once started. and creating the worker thread. //            ID number of the bitmap resource of the whole clock. //            ID number of the bitmap resource of the big digits. //            ID number of the bitmap resource of the small digits. //            FALSE to display date in dd-mm-yyyy format. //        Some error loading bitmaps. //        Failed creating worker thread. //     Pointer to a null-terminated string containig the class version. THIS SOFTWARE IS FREE FOR PERSONAL USE OR FREEWARE APPLICATIONS.